Leading Restaurant furniture distributor helps Brockton, MA sports bar and grill upgrade their seating by supplying it with new bar stools. The Ladder Back Bar Stool is the best-selling bar stool in America. 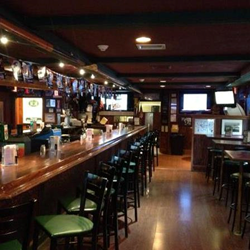 Leading commercial furniture distributor, Restaurant Furniture.net recently teamed up with Mickey Malone’s Tavern in Brockton, MA to upgrade the seating at their bar by supplying them with new commercial bar stools. Mickey Malone’s Tavern is located in Brockton, Massachusetts in Plymouth County. It is a family owned business that was formerly named TK O’Shea’s. The interior has an Irish flair and is very welcoming. There are large screen televisions throughout the pub for customers to enjoy watching many games and sporting events. There is a patio with outdoor seating when weather permits. Their menu offers mostly standard bar far such as chili and cheese, mozzarella sticks, nachos, chicken fingers and Buffalo wings among many other appetizers. They also serve New England clam chowder and baked French onion soup. For entrees they serve burgers, pizza with many varieties of toppings such as tender marinated beef tips, scallions, chourico, Buffalo sauce and more. They make their pizza dough. Other entrees include prime rib and swordfish. They also serve salads. Every Wednesday night Mickey Malone’s offers half off appetizers to all policemen, firefighters, doctors, nurses and teachers. The owner of Mickey Malone’s Tavern needed high quality commercial seating that would look great and be able to withstand the high traffic that the bar experiences on a daily basis. "The owner needed sturdy, durable bar stools that look great, but he didn't want to spend a lot of money," explained David M. He turned to Restaurant Furniture.net because of their reputation for premium quality and strong built furniture at affordable prices. Restaurant Furniture.net supplied Mickey Malone's Tavern with high quality bar stools and tables at competitive prices that fit well within his budget. The owner decided to go with the Ladder Back Metal Bar Stool with black frames and padded vinyl seats. Customers can choose a padded seat or a solid wood seat. The padded seat is made in the USA and can be upholstered in any material. Wood seats are available in 6 different finishes. The frame is available in black, copper vein, silver vein, gold vein or gold. The bar stools are currently on sale for $51. A matching Ladder Back Chair is also available is on sale for $34.50. "The Ladder Back Bar Stool is the best-selling bar stool in America," according to David. "They are versatile enough to blend in with any décor, and the strong metal frame provides the durability that businesses need to withstand heavy traffic." Mickey Malone’s Tavern is located at 347 N. Pearl St. in Brockton, MA. They can be contacted at (508) 427-6444.